Downstream of the bridge Oliver uses a modified roll cast to present his flies close to the opposite bank. He picked up three small browns in the swirling run. Oliver carefully nets a small brown trout. The bedrock was covered with algae and slippery as ice, so caution here was very important. No bleached, tatty looking stockies in this part of the River Ure – the trout were all excellent, fine coloured, wild specimens. Stone-clinging nymphs are the main food source for trout. 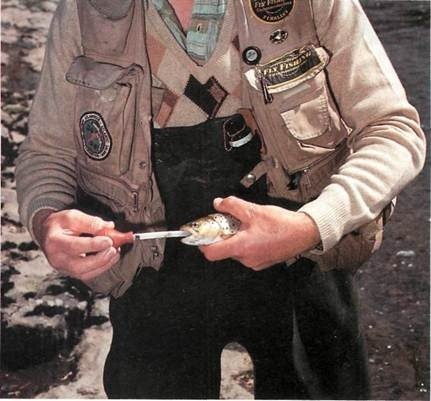 But as Oliver discovered with his suction pump, midge pupae also figured largely on the trout’s menu. By car From Darlington, take the A1 heading south until you reach the A684. Drive west until you get to Bainbridge. The Rose & Crown Hotel is right in the centre of the village. Oliver plays a 1lb (0.45kg) brown trout, keeping it away from willow branches which extend into the deep run on the opposite bank. The Ure is not welcoming to beginners, no doubt sending many huffing up its banks empty-handed. Fishing downstream has disadvantages: you have to set the hook by pulling it away from the mouth instead of into it, and the fish can use the current to its advantage – but Oliver plays the trout patiently and gets the net under it. Oliver’s nymphs are in the exact category of fly tying but aren’t stiff, unfishable show-pieces. Every fly was designed and tied to catch trout as well as grayling. If he had to limit himself to just one on Northern rivers, it would have to be the Partridge and Orange – a classic wet. This, a typical example of a North Country spider pattern (or soft-hackled emerger), has been used faithfully (and highly successfully) in the North of England for many centuries. Fast water with a turbulent surface contains many stone-clinging nymphs – and also most of the trout in late spring and summer. The stone and boulder bottom of the Ure is perfect for both. Oliver fished the riffles until late. There weren’t many rises, so stalking and targeting individual fish -as anglers do on chalk streams – were out. A successful day on the Ure depends on the angler’s water craft skills. Another Ure brown poses for the camera before being released. By train The nearest British Rail station is in Garsdale Head. A dozen or so dark upwinged flies rise from a riffle and are blown steadily towards the bank. A middle-aged man with a checked tweed hat and dark green chest waders runs erratically along the grassy bank, furiously swatting the air. No obstacle too difficult, he plunges over a small gully to catch one of the insects. Tourists stop on the bridge spanning the River Ure in Bainbridge and look on in amazement. Lambs bleat loudly and bolt off as the green chest waders approach. Quarry in sight, the man cups his hand and, in a last-moment attempt, stabs the air. He pockets his prize to study at home. Sheer madness? No. 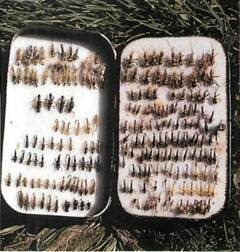 This is part of fly fishing. And the man in green chest waders – Oliver Edwards – is no ordinary fly fisherman. An expert fly tyer and river angler, he’s just as concerned with flies as he is with fishing for trout. When it comes to fly tying and knowledge of insects, Oliver has a deep devotion to detail. One look in his fly box will convince anyone. The only way to fish with a more exact copy of a Heptagenid nymph is to turn some rocks and find a live one. But this concern for detail doesn’t stop there – it overflows into his fishing, from his casting to his water craft skills. Oliver assembles his custom-made split cane rod (rated for a five weight line) and threads the floating double taper line through the rings and sets up his leader. On this bright, windy day in early May it’s as if two different rivers meet at the bridge in Bainbridge. Upstream, the river runs shallow and fast, exposed and surrounded by grey sandstone dales which are home to countless sheep. The odd bush dots the bank, and the wind rips through the treeless countryside. Downstream, the river is lined with willow and alder trees, and the current slows to a canal-like glide, giving the surface a glassy look. There are few tell-tale rises; stalking individual fish is not the order of the day. It’s not surprising that beginners often head for the slow-moving pools with their heavy nymphs and don’t have much success. Oliver is convinced that the fast, popply water is the more productive in late spring and early summer. Most of the nymphs are found in riffles because the water is well-oxygenated. He opts for the upstream section – though the gusty wind will undoubtedly give him problems. 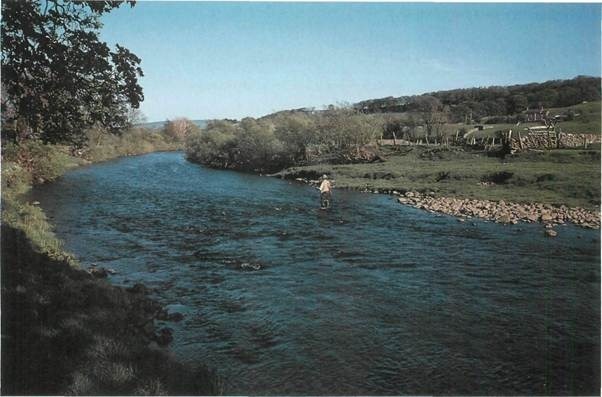 He explains that the stone and boulder bottom of the stretch around Bainbridge is a superb habitat for stone-chnging nymphs – large dark olives, large brook duns, yellow may duns and even late March browns. Stone-clinging nymphs prefer riffles – their flat, armour-clad bodies are perfectly suited to hug the algae-covered rocks in fast water. There are very few areas of silt and sand. Oliver attaches one of his exact-style Heptagenid Nymphs (size 12) on the point and two classic North Country wets – a Partridge and Orange (14) on the middle dropper and a Waterhen Bloa (14) on the top dropper. But the wind is too much: the line is being blown across the surface of the water, making decent presentation next to impossible. So after fishing the riffle, Oliver decides to move downstream where the trees provide some protection. Oliver eyes the water and again chooses the fast stretch which runs under a tangle of shade-giving willows on the opposite bank. One cast in the fast, swirling water under the trees produces a small trout of about (0.23kg) – it took the life-like Heptagenid Nymph. Both banks are fined with trees eager and waiting to coil his three-fly rig into an angry snake. Oliver uses a modified roll cast. 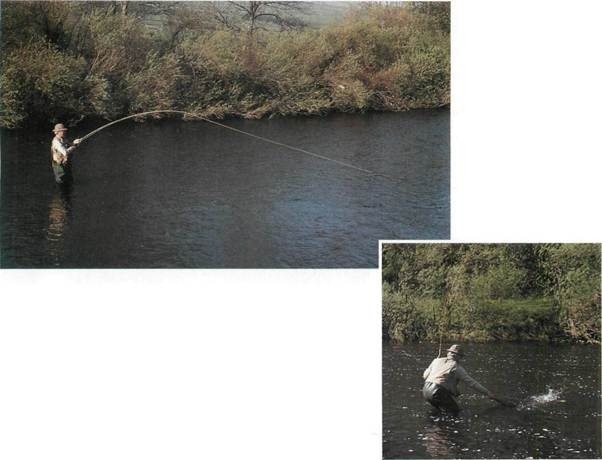 The flies follow the current down while he tracks the rod around and keeps his eye on the end of his line. He strikes at any swirls near his flies or if the line moves at all. Ten minutes and a dozen or so casts later he’s in with two more small browns -both took the nymph. Oliver continues to walk downstream as he fishes the stretch of swirling water. But as the flow begins to slow into a long glide, the takes diminish. He approaches a grove of small trees lining the opposite bank where the current flows quickly and forms a small but deep pool at the end of the run. He’s pleased with this stretch. The water is fast, and the surface is marked by turbulent water. 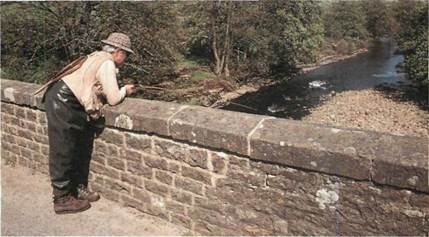 He seems to be looking at the hidden detail of a river – forming a mental picture of the bottom, the insect activity there and the location of the trout. He comments that every square yard of bottom is unique and deserves careful thought. 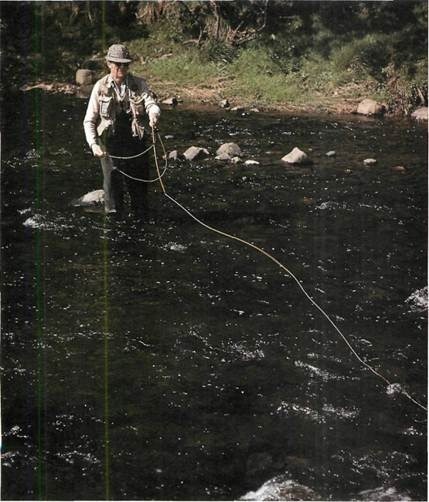 Oliver positions himself upstream and begins fishing down and across. 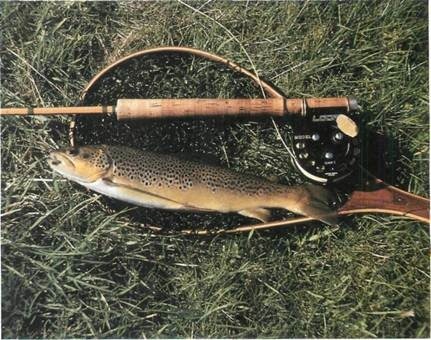 One cast, one take, one solid hook-up, one fish — a stunning 1lb (0.45kg) brown trout which took the Partridge and Orange. Pumping its stomach with a handy suction pump, he finds midge pupae and emerging stone-clinging nymphs. He releases the fish soon afterwards, and it swims off with an empty belly but none the worse for its ordeal. Oliver casts to the opposite bank, his flies landing within inches of the extending willow tree branches. The flies drift along the bank slowly. He again follows them with the rod. After another cast, he takes two steps downstream and repeats the process in a smooth, fluid rhythm. But this time the flies drift only a few feet before a mouth nails the Partridge and Orange, piercing the surface of the water. It takes line as it steams downstream. Oliver doesn’t bully the fish, but plays it out, coaxing it to the slower water near the bank. Soon a beaten 0.7kg brown glides head-first into his net. 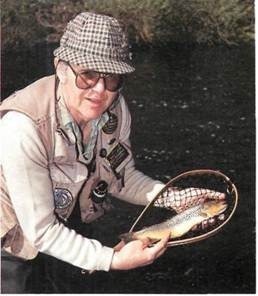 That classic North Country fly, the Partridge and Orange, is removed, and then the trout is released. As with most North Country wets, the current moves through the soft hackles of the flies and makes the fibres pulse, giving the impression of a blur of legs. Lightly dubbed bodies (called misting by Oliver) and exposed thread on flies such as the Waterhen Bloa help to increase the overall translucency. He continues to work the stretch along the willows, taking four more brown trout there, two on the one pound (0.45kg) mark, before deciding to move to another riffle downstream. These fish meant business and didn’t waste any time in taking. The light is fading, yet there aren’t many rises. Oliver is again working downstream, this time on a stretch of fast water only 15-25cm (6-10in) deep. He has a take but loses the small trout. This has happened a few times already during the day, but he isn’t bothered. ‘If you’ve concocted something in a fly vice, and you get a fish to tip up in the current and take it – that means one thing: you fooled the fish.’ Two small browns come to the net – one on the Waterhen Bloa and one on the Partridge and Orange. Pale coloured ephemerids come off the fast riffle. This time, however, Oliver is unsuccessful in obtaining a specimen. He fishes for another two hours and ends the day with a grayling where the Bain enters the Ure. 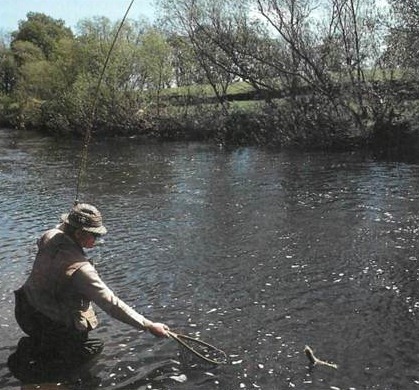 With 13 fish to his credit and dozens of takes from the upper reaches of the River Ure, it’s no wonder he’s considered by many game anglers to be the best imitative fly tyer and river fisherman in Europe. We make our way up the hilly riverbank and over the sandstone walls towards the Rose & Crown for a good pub meal and a well-deserved pint of Yorkshire bitter.